Place ham on a rack in a shallow roasting pan. Score the surface of the ham, making diamond shapes 1/2 in. deep. Bake, uncovered, at 325° for 1-1/2 hours. Meanwhile, in a small saucepan, combine the remaining ingredients. Bring to a boil; cook until glaze is reduced by half. Remove from the heat. 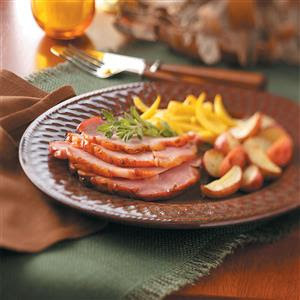 Baste ham with glaze; bake 30 minutes longer or until a thermometer reads 140°, basting twice with glaze. Serve with remaining glaze. Yield: 18 servings.